July 7, 2013 Victoria, BC (ISN) – The Peninsula CO-OP Highlanders were looking to gain some ground on the league leading Vancouver Whitecaps on Saturday and a visit from the struggling Coquitlam Metro Ford Extreme was a good way to achieve that goal. The Highlander ladies put on a fine performance, controlling possession for the majority of the game and came out on the top of a 7-0 decision. 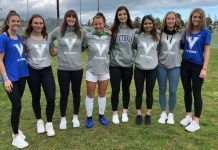 Peninsula’s offence was lead by a hat trick off the boot of Liz Hansen, while Elise Wyatt added a pair and singles went to Abigail Raymer and Mallory Hackett. While not tested often Olivia deGoede did have to come up with a couple of key saves to earn the goose egg. 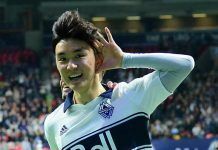 With their task completed, the Highlanders would look to the Pacific Coast Soccer League scoreboard to see how the Whitecaps faired against the 3rd place Okanagan FC. Unfortunately the Whitecaps were also firing on all cylinders as they downed Okanagan 10-1 and still remain 10 points clear of the 2nd place Highlanders. 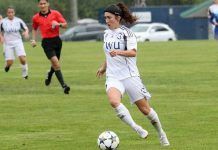 The Highlanders have 4 games remaining in the regular season but hold 3 games in hand on the Whitecaps, who finish the season against Coquitlam, and a win would secure them the top spot with 39 points. While Peninsula has the odds stacked against them taking over 1st, they will be looking to finish strong and go into the Challenge Cup tournament at the end of the month with confidence. The Highlanders are in action today on the Lower Mainland against the North Shore Girls Soccer Club Eagles. The ladies will be back home on July 13 when they take on Okanagan at Royal Athletic Park at 5 pm.